Dialog is generally regarded as a good thing. Particularly in these polarized times, we are surely in need of dialog, and a lot of it. But when we think of dialog, we are usually thinking of dialog about something. And we think of mutual understanding as the salubrious result. 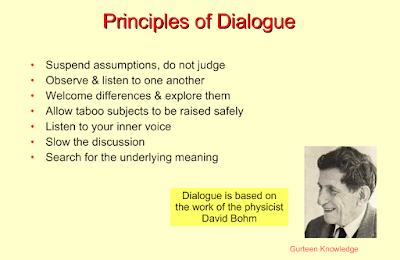 David Bohm (1917-1992) encouraged dialog that isn't about anything, and in which misunderstanding is a necessary component. The best available corrective for the inherent error of any thought I might have is encounter with someone else’s thought. In other words, dialog. Of course, other people’s thought is just as wrong as mine is. The point isn’t to arrive at some better opinion to settle into, but simply to unsettle our opinions. He’s not saying get rid of your opinions. Just: unsettle them. “People wish to be settled. Only insofar as they are unsettled is there any hope for them” (Ralph Waldo Emerson). The great value of dialog isn’t that we get better or broader opinions, but that we come unsettled from any opinion, unsettled from any definite thought. Beyond that, said Bohm, true dialog can’t have a purpose. Dialog may end up accomplishing a lot of things, but we can’t start out with an idea of: “Here’s our problem, and how are we going to fix it.” That approach locks us into thoughts about what the problem is, and what a solution would look like -- thoughts that are always awry. In dialog, we bring our thoughts, but try not to be locked into any of them. Everything is up for grabs in the free flow of ideas. A dialog group is not like a problem-solving group, a strategy group, or a planning group. It’s more like people sitting on the back porch sipping lemonade and gabbing about nothing in particular. In that context, anything can come up, and a thought at any level can be called into question without making people impatient to get on to the point. Indeed, whatever is being offered is the point. Goallessness is crucial. A dialog group needs conflict, so it needs to be fairly large. A group of less than 20 won’t generate enough conflict. In conflict comes the unsettling and the possibility of wholeness that we can never have on our own. Dialog is something very different from the sort of discussion that “where people are batting the ideas back and forth and the object of the game is to win or to get points.” Instead, dialog depends on careful attention to subtle implications of one's own, and the group's, assumptions and reactions, and a predominant mood of relaxed, nonjudgmental curiosity. In Dialog, each individual agrees to suspend judgment in the conversation. “Suspend” doesn’t mean you don’t have the judgment. It just means you don’t live there. You don’t suppress the thought, nor do you indulge it. You “suspend” it – as if it were hanging in the air in front of you, and you just look at it, watch it. And you watch what the effects of the thought are. The thought “you are an idiot,” is going to be attended by feelings: agitation, anger, resentment. Don’t suppress those either. And don’t indulge them either. Watch the feelings as they run their course. See them without identifying with them. Suspending an assumption or reaction means attending to it without following through on it. Dialog participants try to build on other individuals' ideas in the conversation. In this way, misunderstanding each other is central to the enterprise. In the misunderstanding of what another person meant, we might bring forth a new meaning. "Bohm Dialog" does what the spiritual path generally does: helps us understand ourselves. What Bohm Dialog most centrally teaches is the current state of the group the participant is in. Sound like fun? Find 19 other people and give it a try.